From Talking Pots Day, when the aunts all gather to make the biggest pot of soup in town, to gathering round Gran Lee's stove on a cold winter afternoon, to serenades and stories late at night, when the rest of the world is asleep, "seems like everything good that happens in my house happens in my momma's kitchen." A celebration of African-American families and mommas everywhere, In My Momma's Kitchen tells the story of a year's events in everybody's favorite room. From Talking Pots Day, when the aunts all gather to make the biggest pot of soup in town, to serenades and stories late at night, when the rest of the world is asleep, "seems like everything good that happens in my house happens in my momma's kitchen." A celebration of African-American life and the bonds that unite all families, generation after generation. 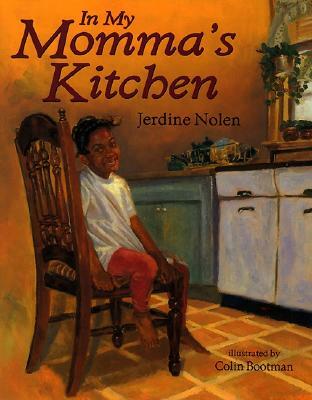 Jerdine Nolen is the author of a diverse range of picture books, from the thoughtful In My Momma's Kitchen to the wildly imaginative Harvey Potter's Balloon Farm, which was made into a TV movie. Jerdine Nolen lives with her children in Ellicott City, Maryland. Colin Bootman was born in Trinidad but moved to New York City at the age of seven. A graduate of the School of Visual Arts in New York, he has illustrated six picture books, including the popular Oh, No, Toto! (Scholastic). Colin has four children: Shantaquira, Aaquil, Rashida, and Rashaud. He lives in New York City.